Ben Alnwick in action against Crewe. Pride will motivate the Posh players as they embark on the first of three meaningless League One fixtures at Barnsley this weekend. And goalkeeper Ben Alnwick, a former Barnsley player, is adamant the outstanding Posh fans won’t witness another witless display like the one they were forced to endure for 45 minutes against Crewe on Tuesday. 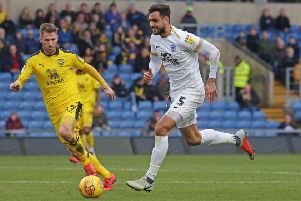 That 1-1 draw ensured that Posh will play League One football again next season something that angers Alnwick as he believed he had joined a Championship club in the summer. “We’ve proved that we can give any team a run for their money in this division,” Alnwick said. “And we looked a really good side at the start of the season so it’s very disappointing that we are going to finish short of where we want to be. “It’s about pride now for the rest of season and then we need a good summer to get ready to kick on get promoted next season. “This is a Championship football club in my opinion and we need to get back there as soon as possible. “We will go out and try and win the next three games and so take some momentum into next season. We certainly won’t play like we did for the first 45 minutes against Crewe. “I don’t know what went wrong there. It was as though some players weren’t pulling their weight and didn’t want to be on the pitch, but some home truths were spoken at half-time and we played much better in the second half. “We were all up for the game beforehand, our pitch was the best it had been all season and it was a team we were capable of beating 4-0. “I spent time at Barnsley so it’s a game I want to win. It’s a great place to play football and the lads will enjoy it and hopefully we will get three points. “The fans deserve a strong end to the season. They have stuck with us even when times were bad. “I certainly don’t regret coming to Peterborough. I needed to play games and I’ve been happy with my form. Alnwick (27) had never played more than 25 games in a season before joining Posh. He’s made 42 appearances for Posh this season. He played just 10 times for Barnsley.